I haven't done Illustration Friday in ages, but I still get the email notices and I liked the topic "Quiet" so much I had to do a quick little picture today. An alternate title would be "Hide-and-Seek". You can click on the picture to see it a bit larger. Thanks for visiting! Very cute. I love the colours, nice combination! lovely! so pretty illustrations! you´re a complete artist! 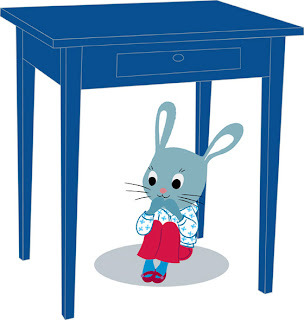 Such a cute little bunny in her little red, white and blue outfit. Nice!